The words that we study in this article all begin with ama which is written with the cosmic allograph for the Wosite a . Ama is the Wosite word for cosmos, which includes sun, stars, and galaxies. It also describes a highly respected person. 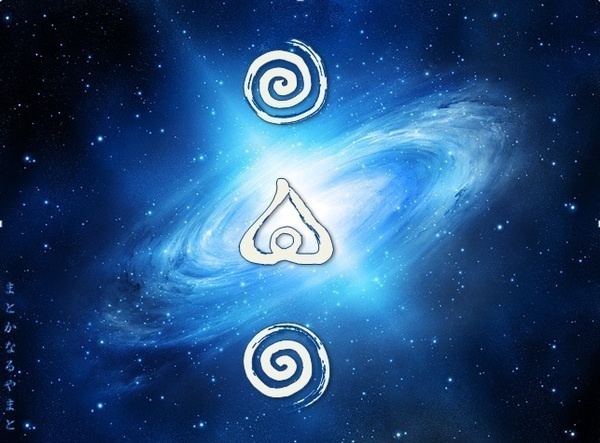 The a in ama is written with the cosmic spiral of a.
Kami is a word from ancient times which is still used today. Kami is a powerful force of nature or a person who possesses great power and has earned great respect. Amakami is a special term, a title, for a secular-spiritual leader in Wosite times. Amakami was a leader who stayed connected with Ama Cosmos. Amateru is the best-known Amakami in Hotuma Tutae. Let us try to understand Amakami through Wosite analysis. First, for Ama, look at the right of the illustration below, and note how Ama is written in Wosite. The usual form of a has been replaced by a spiral that opens to the left. This is a special ideogram, an allograph, of a when it is associated with Cosmos or Universe. In Wosite analysis, we treat it the same as the basic circular utuho-tai for a. The ideogram below it in the figure is ma, the circle of utuho-tai with an overlaid T-glyph indicating strong will. Therefore Ama refers to the energy from the Original Presence, the presence that originated Universe. Finally the term we analyze is amakami. The ideogram for ka means shining, as in kaguya. It also implies megumi wo watasu, sending blessings. Mi is a wind-like energy which is balanced and sent down. The amakami of the past always shone brightly for his people, sending them abundance equally, without thought of personal gain. Amanohara (also Ahara) has important meanings in ancient Japanese. (See our later posts on Ahara and Takamanohara.) Amanohara is the place of the Amakami’s Congress. Amakami as the leader communicated with Ame Cosmos and the ancestors who returned there. This meeting of communication with Universe was held at the miya, Amakami’s residence. The meeting is called maturi. Although now we think of matsuri as a festival at a miya Shinto shrine, the original meaning of maturi was connecting with Universe and its laws for the welfare of the people. By connecting with Universe, Amakami was following the Amenaru-miti, the Laws of Universe. This was Amakami’s most important responsibility. Amanohara has the greater meanng of Cosmos and all the Laws of Universe. Regretfully now, these meanings of Amanohara have been lost to modern people. Amemiwoya is the Great Source, that which produced Universe, the essence of existence. Amemiwoya generated Universe, and is the Presence of the Origin. Amemiwoya is Energy from the Original Presence. Amemiwoya taught the To no Wosite, the Amenaru-Michi, and other great teachings of The Way. Ame is the universe. Mi is a high honorific of great respect. Woya usually means parent. But Amemiwoya is not a person, rather “Something Immensely Great”. This entry was posted in Cosmos, Vowels and tagged Ahara, Ama, Amakami, Amanohara, Amemiwoya on 2016-01-02 by Okunomichi. 1. The ideogram a is a dot in a circle. The circle is utuho-tai. What, then, is utuho? Utuho is uchuu universe when it is umu born out of void; it is unseen, it is pure potential. 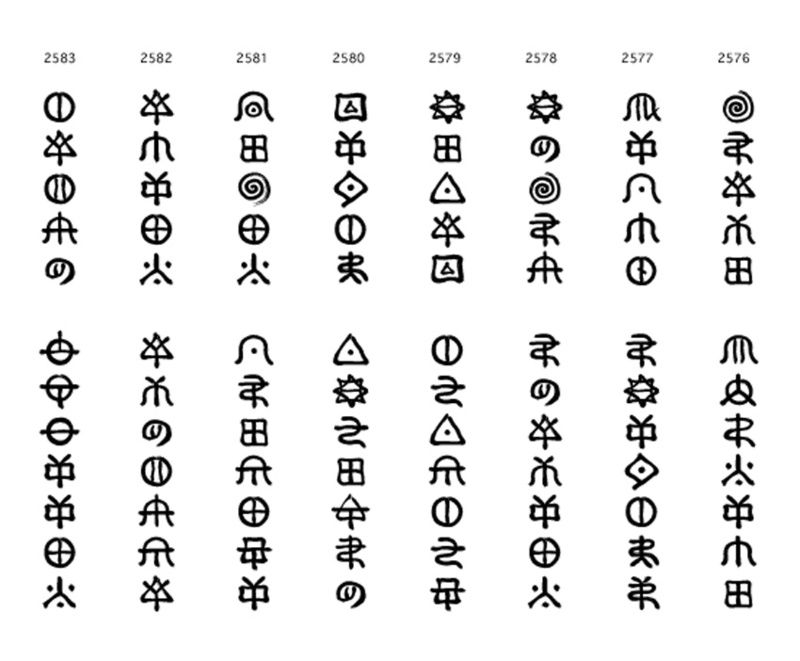 In the illustration below, utuho is spelled out in Wosite ideograms for u-tu-ho, read top to bottom. 2. Ho-tai is the triangular form of u vowel energy. See the article posted about ho-tai. Ho-tai represents the flow of energy from the left corner upward to the top, then down the right side, and finally horizontally to the left. The dot in the center of the triangle signifies an originating energy. This ideogram means great heat moving even now, as is necessary for the continuous origination of all things. Next, consider the ideogram for tu. Tu is made up of the Y-like glyph of ta-sou overlaid on the triangle of u. The Y-glyph represents reception of energy and the sound of the consonant t. Note the junction at the center of the Y. The two arms gather energies from above, and balance and harmonize the energies; the vertical stem brings the energy downward. The third ideogram is ho. It is made up of ha-sou for consonant h and hani-tai for vowel o. The two lines of ho represent duality: up and down, male and female, etc. The square of hani-tai is like a box, bounding the contents and completing creation. Utuho is the birth of all things, of all life. Next, we look at words containing the utuho-tai, the a vowel sound. Let us analyze asakotoni. First, asa. Asa is made up of two circular ideograms. There is a dot in the first, and a horizontal line in the second. The a ideogram is the unseen original energy, full of potential. The Sa ideogram has a horizontal line which indicates the balancing of energy. Sa is very bright and full of light. This helps us to understand asa as the time of day when the sun is rising and very bright, it has full potential. * Particle, joshi: Japanese particles, joshi or teniwoha, are suffixes or short words in Japanese grammar that immediately follow the modified noun, verb, adjective, or sentence. Their grammatical range can indicate various meanings and functions, such as speaker affect and assertiveness (Wikipedia). In other words, joshi is not a noun, verb, adverb, or adjective per se. We may consider them “connecting words” since they give the relationships between the other words. They are very important in Nihongo. The Wosite energy analysis goes something like this. Look at the images on the left. We have discussed the dot and the bar. We already know the meaning of the vertical k line, and the Y glyph for the t sound. The plus symbol represents connecting the energies both vertically and horizontally. 4. Ame means rain. It is shown in red. The expression we will study here is ame to huru nari. First, let’s look at ame, on the right. We have the same a as before. Now for me we have the river-like image of mitu-tai vowel e with a T-like glyph for the M sound. The energy which is always flowing is received and sent down. This is the real meaning of rain. The particle to connects with ame and emphasizes it. This is due to the emphasis of the hani-tai of to. As for huru, there are two triangles. Hu contains two vertical bars for the back and forth or male and female aspects of energy. Ru has the upside-down Y indicating energy that is moving down and dividing as it goes. Nari is a joshi. 5. There are various allographs (alternate forms) of the ideogram a: the basic, the formal, and the cosmic. The different ways of writing it helps us understand what is meant. The cosmic allograph indicates a connection with Ame, Cosmos. This entry was posted in Cosmos, Vowels and tagged Allograph, Ame, Asa, Joshi, Particles, Utuho on 2016-01-02 by Okunomichi.